This entire day is going to spend on visiting Uluru and Kata Juta (The Olgas) and enjoying the indigenous activities included in our package. I’m at Avis stand to get my car some minutes before 9 AM and I’m leaving with a sort of pickup with service lights, as the ambulances have. With this I pick up my wife and leave the resort some minutes past 10 AM, once we’ve taken our breakfast. We’re at the entrance of the park in no time and there we pay 25$ for each of the admission tickets. Then we follow the road with the spectacular view of Uluru just in front of us. We feel the needing of stopping for some pictures just before taking the road to Kata Juta. Leaving Uluru behind, the landscape is an endless land of red sand covered with some small vegetation and the rounded tops of Kata Juta at the horizon. Our first stop is in the middle of the road, and then we reach the parking area belonging to the “Dune viewing”, a lookout just 300 meters from the cars. 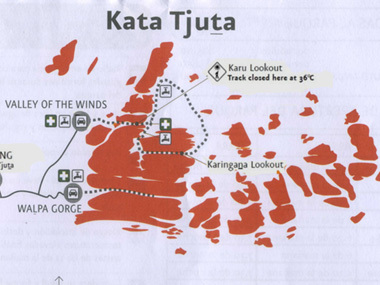 We made our decision very quick for the walks we’re going to do in Kata Juta: Valley of the winds until the first lookout (2.2 km return trip) and Walpa Gorge until the entrance to the canyon, between two big red stone walls. I remember soon what I read about flies here: they chase you in a very uncomfortable way. That is the reason the most of the people here is wearing a net all over their heads as the flies that are constantly in your face are the worst ones. After an entire life hearing “A closed mouth catches no flies” is now I learn to shut up, when one of them has just touched my throat. The walk to Karu lookout is gentle and, once there, we can see a these red rock formations appearing over the huge plain as heads. This is different to anything else: this red sand all around with the tall walls of polished stone of that same color. In Walpa Gorge, the way to the beginning of the canyon is longest that it seemed and we do the walk almost entirely. 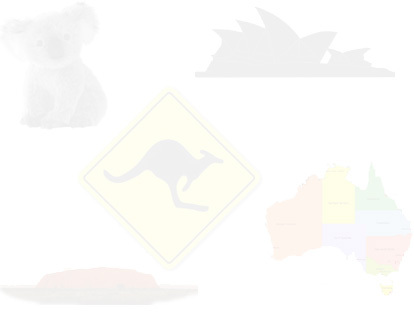 Here everything is larger than it seems. With this we’re done in Kata Juta and, around 1 PM, we drive the road back to the lodge. There, we use the kitchen to prepare the delicious porterhouse we’ve brought. The meat is excellent in this country and is one of the cheapest foods too. Some minutes past 3 PM we’re back on the road to get the park for visiting Uluru this time. Our first stop is at Cultural Centre and, from there, we follow the road around the huge red rock until Kuniya Walk, the one we’ve chosen. It’s just 1 km return trip. We have no rushes and enjoy every spot along the way: caves with aboriginal paintings, touching Uluru, rocks fallen from the mountain surface,… and the highlight of this walk, which is at the end of it, a drain from the top marked on the stone by the water during the years and a small lake at the foot. This is a strange and beautiful view. Once back in the car, we complete the road around Uluru with short stops at some points for pictures. Among them a popular place, Mala Walk, we’ve discarded because it’s long. When we are back to the Cultural Centre we take the road to exit the park. But we still are not leaving it. It’s 5:30 PM and that’s the time we thought to go to the Car sunset place. We choose a slot in the parking looking to the rock, which looks magnificent from this place. It is already full of cars, vans and motorhomes with people waiting to enjoy the color changes in Uluru at sunset. We’re not going to enjoy the sunset itself as the sun is at our back. Still more vehicles coming here and we can see a big range of ways of taking Uluru images: fixed tripods, flexible tripods, go pros, drones, etc… We watch the show from the top of our pickup, seeing how the red is getting darker and more intense. We leave when the sun is gone and the color of the rock can only go to black but, still, we’re one of the first to leave, which is good. We cook spaghetti Bolognese using a couple of the burgers we’ve brought and go to bed satisfied for this wonderful day.